Generates valid GUIDs with hypens and braces and without hypens or braces. 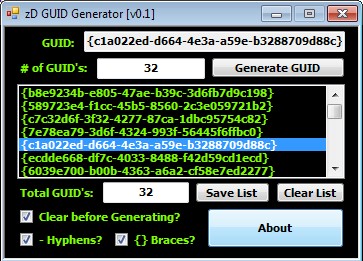 You can generate a number of GUIDs and you can save them to a text file. + Ability to generate a number of valid GUIDs. + Ability to save generated list to a text file. + Ability to clear generated list. + Ability to generate GUIDs with braces and hypens. + Ability to generate GUIDs without braces/hypens. + Ability to clear list on generation. zD GUID Generator 0.1 NEWEST!